Up early and down for a final breakfast of bagels and doughnuts. We were due to pick up the hire car at 10am, so we had a while to waste before then, so we went out a walk around the hotel. We stopped off at the general store next to the hotel to buy some new camera films. We were in two minds what to do about the cases when picking the car up. It was 6 blocks north to the car rental place, and dragging all of our luggage was not an attractive proposition. We weren't sure if we'd be able to park the car outside the hotel while we checked out, either. In the end, we checked out and I left the two large suitcases in their left-luggage room. We made our way up to the car rental place with the kids dragging their small cases on wheels. At Dollar, there was a considerable wait, or perhaps we were just impatient. We had to pay locally for the baby seats, but everything else had been pre-booked, including all insurances. Eventually, after leaving an $800 deposit (fairly standard in NY State apparently) we picked up a white Chevrolet Classic, not the most attractive colour in the world, but after I checked out and recorded the dings on their official sign-off, we threw the kids and their luggage in the back and headed out into the mean streets of New York. Karen was driving, and I guided her back down to the hotel. While she waited outside, I nipped back into the hotel and retrieved our luggage. Before closing the trunk, I got out the large-scale road map of the US from one of the cases. Back in the car, I opened the map at the two page spread on NYC. I had no real idea how to get out of the city, but I knew we had to get onto one of the freeways as soon as possible. Driving in NYC is an experience, lots of beeping from cars, pedestrians walking across you when you have right of way. To make things simple, we headed straight up 8th Avenue until we hit the park, then turned left at 72nd street and hoped we could pick up the Henry Hudson Parkway, which we did, after a bit of confusion. Once we got up the northwest side of Manhattan island, we got onto the Cross Bronx Expressway and I'd gotten my bearings on the map. Eventually we got onto the I-95 at the proper junction and soon crossed the state line into Connecticut, but it had taken us over an hour to get out of the city. Very soon we passed by the famous Mianus, where Jackass did their extended joke about the place (Season 1, Episode 5 for the geeks - "There's a little Jack Russell Terrier in Mianus!"). We didn't drive though Mianus, the idea of parking a car in Mianus wasn't very welcome. Around lunchtime we stopped at a Denny's somewhere in the middle of nowhere for some lunch, and continue our journey towards Cape Cod. 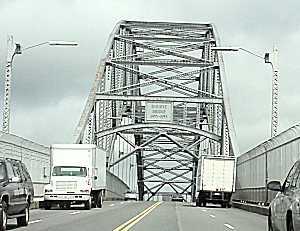 We eventually arrived at Bourne Bridge, where the road crosses the Cape Cod Canal and we were officially in Cape Cod. The traffic here started to get hideous, this being a well known gridlock spot. We decided to go look at Woods Hole before going to the hotel, and we head south on the 28, but by the time we got to Falmouth, the traffic was horrible and it had started to rain. Abandoning Woods Hole for then, we turned and made our way at crawling speed for Hyannis behind the traffic. It took us another hour to get to Hyannis, and we checked in and collapsed on the beds. 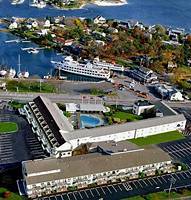 The hotel was the Hyannis Harbor Hotel, a maritime themed hotel with weatherboards and decking, a real change from the NY accommodation. The hotel faced right onto Hyannis Harbor across the road, and ferries from Nantucket and Martha's Vineyard drew up twice a day. Once we were composed, Connor and I went out for a wander around the hotel, to locate the dining room for the next morning's breakfast. We found the outdoor swimming pool already full of kids, but the inside one with jacuzzi completely empty. The weather up the New England coast wasn't as warm as it had been in NYC, and we decided that we'd make use of the pool, so we went back to the room to get ready. We all got into the pool, which was heated, so was at a very comfortable temperature for the kids. After a bit of swimming around, Karen and I decided to try the jacuzzi, which was piping hot and great fun. We weren't sure the kids should spend time in it, for the heat, but they wanted to try so we helped Niamh out of the big pool and Karen guided her to the jacuzzi, where she promptly jumped in, went straight underwater into the hot water, and had to be pulled out, screaming. She wasn't too keen on the jacuzzi after that, and Karen took her back to the room, while Connor and I swam about some more. Eventually we came out and made our way back to the room. We were getting hungry, so we went out a walk down to the harbourside to see if there were any places to have a bit to eat. There were a few famous fish places around like Bubba's BBQ, Schooners, and Spanky's Clam Shack, which was already full up with mostly older people and no kids. So we continued up to the top of Ocean Street to the park area at the head of the harbour and sat and watched the sun go down over the sea. 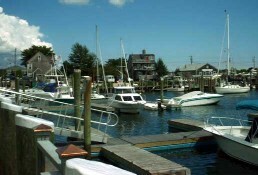 On the way back, we decided to play safe and eat at the open air restaurant which was out front of the hotel, so we found a table and ordered and looked out over the beautiful New England coast. I ordered Oysters for starters, and everyone wanted to try them, they were poached, garlicked and delicious. Nobody else liked them but me. I was tempted to go for a lobster meal, but thought it was a bit much on our first night in New England, so we both had traditional fish and chips, which we didn't expect to see in the US anywhere! The kids had smaller portions, and as the sun set, Connor began to complain about feeling chilly. Karen went up to get his jacket, but he continued to feel a bit bad, so we took them back to the hotel room and got them into bed. When they were asleep, we snuck back out to the open-air bar and had cocktails sitting at the bar. The famous Cape Cod mist rolled in with the ferry from Martha's Vineyard, although it was still warm enough to sit in short sleeves. Eventually we called it a night, and went back to the room and to bed.